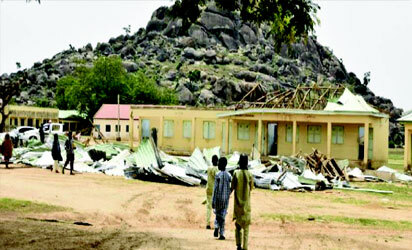 Heavy downpour in residents of Bauchi resulted to many buildings being damaged and millions of Naira displaced on Sunday. It was learnt that the rain started by 4pm during the celeration of Eid-el Fitri. The provoking rainstorm uprooted many trees and covered many cars- putting houses of residers in dismay. The family of Bauchi State correspondent of the News Agency of Nigeria, NAN, Kaigama, narrowly escaped death when their apartment collapsed, following the rainstorm. Kaigama said his wife, two children and an in-law were in the sitting room of his Wuntin Dada residence in Bauchi metropolis, when the rain started. He was out on official duty. His words: “Suddenly, the wind and rain became stronger, forcing the walls of our compound and bedroom to collapse. Speaking with newsmen, the Bauchi State Communication Coordinator of Red Cross, Hajia Asma’u Tijjani Umar, said the level of devastation in the disaster was alarming.